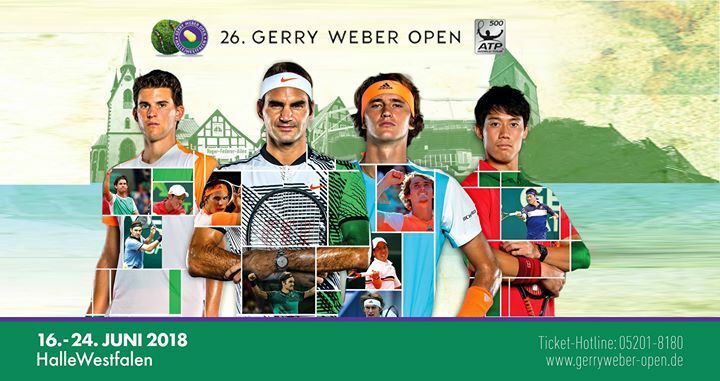 The Gerry Weber Open, an ATP 500 event on grass in Halle, Germany is a pivotal warmup on the road to Wimbledon. Here is your look at all the action that is ahead. Roger Federer should ease past Aljaz Bedene and Benoit Paire/Steve Johnson to reach the quarterfinals. Australia’s Matt Ebden is solid on grass and I have him meeting Federer in the quarters after defeating Malek Jaziri and Philipp Kohlschreiber or Marton Fucsovics. Federer should reach the semis regardless. Dominic Thiem, who wants to compete at Wimbledon, should be good enough on grass to defeat Mikhail Youzhny and Max Marterer or Yuichi Sugita to reach the quarters. Lucas Pouille has a tough opening match against Stefanos Tsitsipas but if he wins that he should defeat Denis Kudla/Lukas Lacko and then upset Thiem in the quarters to setup a semi against Federer. Alexander Zverev faces off with Borna Coric in a highlight worthy round 1 contest the relatively in-form home favorite should see off Coric and countryman Peter Gojowczyk (or Rudolf Molleker) to reach the quarterfinals. Rosmalen champ Richard Gasquet looks set to defeat Florian Mayer and Andreas Seppi/Matteo Berrettini to reach the quarters opposite Zverev, who I’ll back as the favorite. With just Matthias Bachinger and Mischa Zverev or Karen Khachanov in his path, Kei Nishikori looks set to reach the quarters and defeat Spain’s Roberto Bautista Agut at that stage. RBA opens with J.L. Struff, Robin Haase or Joao Sousa will follow. Look for Germany’s Zverev to have a nice run at home but Federer should take home the title and retain #1 regardless.